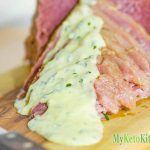 A delicious and tender Corned Beef recipe thats ideal for Keto Diets. High in sodium to fight fatigue and accompanied with our delicious high fat "Mustard Sauce" It a Winner! Rinse and dry the pickled beef with paper towel. Prepare your ingredients. In your pressure cooker saute the carrot, onion, thyme and garlic in the olive oil for 4 minutes over high heat. Add the peppercorns, red wine vinegar and salt and cook for 2 minutes. Add the beef and pour over the beef stock, you may need to add a little more water or less stock depending on the size of the beef and also the size of the pressure cooker. You want the beef to be only just covered. After 2 hours turn off the heat and leave for 20 minutes to release the pressure slowly, then carefully open the pressure valve on the lid to release any excess pressure, and take off the lid. Gently remove the corned beef, if you have a large piece I recommend using a set of tongs to grip the meat from the top and a rigid spoon or lifter under the bottom to support the weight. Slice up your corned beef and enjoy. We discard the cooking liquid and vegetables as the contents of the pot is very salty, it can be strained and used to flavour soups if you desire. Add the cream and mix together. Initially the butter and the cream will stay separate but will come together as the heat rises. Be very careful not to boil the sauce, as it will not combine. As the cream reduces the sauce will thicken, you want to reduce the cream by one-half. Add the chopped parsley, pepper and salt, and drizzle over the corned beef to serve.